3.49 pm Various Palin sites are frantically removing various incendiary materials - which is both gratifying, but also, it seems to me, an acknowledgment of previous rhetorical excess. 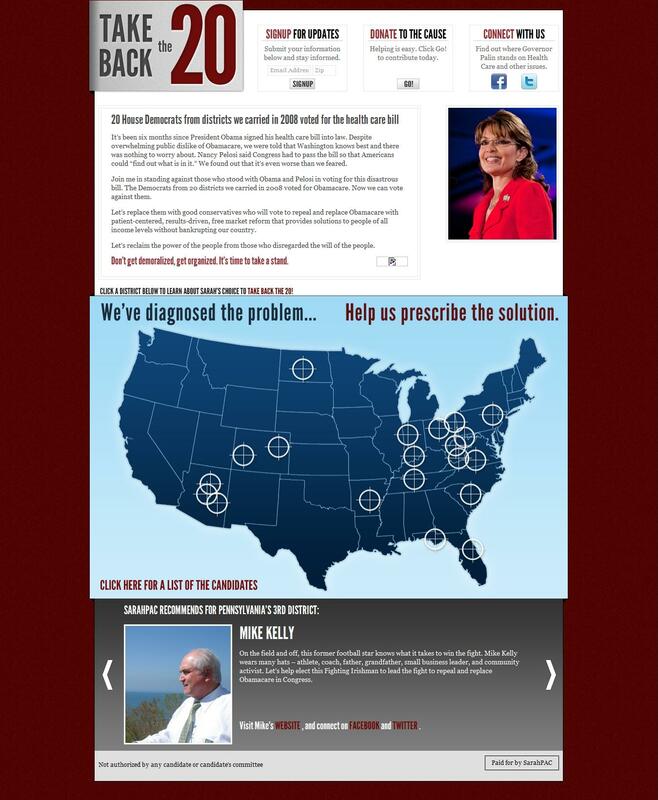 TakeBackThe20.com is in meltdown, images like these are being removed ASAP, and Palin's Facebook page simply cannot cope with the number of commenters blasting her. They're doing this less out of a desire to be helpful than out of a desire to hide their role in the shootings. Ah, the "Never let a crisis go to waste" crowd (thank you, Rahm Emmanuel) is going into overdrive...there is no desire to hide any role because there was none. I can see by the supposedly offending flyer that there are two cross hairs over the State of Colorado. Though I have never seen this political ad until now, I understand what it means: it means that these seats were targeted by this group. So unless we all want to embrace 1) an official repeal of the First Amendment, or 2) some sort of back door, de facto, unofficial Sharia-style repeal of the right to political speech, then we had best focus on something other than the content of this evil doers political ranting. Orin, to my mind it would be sufficient if people behaved in a civil manner and kept in mind the possible consequences of violent talk. Civil manner -- like not calling people caustic names like "showernuts"? No, Anon, sorry to make this so hard for you. There is no harm in using a phrase like "showernuts," it is evocative, colorful, and accurate. I mean that perhaps people can have a discussion of the issues without threatening one another with violence. and then assert that Sarah Palin, the TEA Party et al were the genesis for this mentally disturbed individual becoming violent. While I will not speak for any liberal, this conservative does not think for a moment that evil can be eliminated from this world. Much like Judge Roll, who had just came out of Mass, I understand the one thing I have control over is myself. Orin, there is no indication yet about "why" this mentally unbalanced person did the thing he did. It is true that Sarah Palin literally "targeted" Giffords, and that rightwing politicians have routinely used gun and assassination imagery in their speeches and campaigns. Go ahead and defend it, go ahead and say that speech has no consequences, I'm not going to argue with you about why a paranoid person did something. Well, Jim. I understand your points about you not finding "shower nuts" offensive. It's hard to be the word police isnt it? What some find "evocative" others find "provocative." What some find to be "colorful" others find to be "dark hearted." Placing gun cross-hairs over any person in a any campaign is never a good thing, and you know it. It is reserved for extremities. If it was done to you, or your children, you would feel terrorised. Do you have any idea how grotesque this appears to the rest of the World, including among your closest and natural allies? Go ahead and claim "But we don't care"
No. Really. Go ahead and claim that. For God Almighty sake, there an entire industry out there based on that assumption: words eventually convince SOME people to do something. Anon, it is likely that George Bush is a war criminal. There were many violations of federal and international law while he was Commander in Chief. Many believe he should have the right to clear his name in a trial where charges are brought, testimony is entered, evidence is presented, and a judge or jury decides. That's the so-called rule of law that some people think is important. Do you see the difference between that and the Second Amendment remedy proposed outright or hinted at by conservative leaders? putting cross hairs over a candidate is not. How about "battleground states" ? Don't you see what a can of worms you are opening Jim...do you really want some govt agency telling you what you can and can't say ? and we really need more govt agencies ? I thought the left was a defender of free speech. Latino's should "punish our enemies" in discussing the upcoming mid-term elections. You should "get in their face and argue with them" talking about the 08 elections. those were both barack obama. Free speech or banned political escalation ? So when the DNC did an almost identical ad to Sarah Palin's in 2004, targeting Republicans with the bullseye -- was this okay? The first three words in their ad, entitled "Targeting Strategy" were "BEHIND ENEMY LINES" (capitalized). How come JIm didn't post THAT ad? and showing Jesus eaten by ants on the cross is not hate speech or inflammatory ? and showing the cross in urine is not hate speech or inflammatory ? Your double standard here Jim is pretty darn indefensible. Anon, people argue, people take positions, people take it personally, that's just how it is, there is nothing wrong with fighting to win. People do not threaten to kill one another in a political debate, at least civil people don't. It is telling that you do not make the distinction. but by your new "word police" would this be okay ? In a radio interview that aired on Univision on Monday, Mr. Obama sought to assure Hispanics that he would push an immigration overhaul after the midterm elections, despite fierce Republican opposition. Sure I do...no more "grotesque" though than when similar tragedies occur in Western Europe or even in your own country (Australia?) That Ivan Robert Marko Milat seems quite the nasty criminal mind. I cannot speak for the "we", I can only speak for the "I" as in singular: I don't care what other countries think of the US. Call me a mean, nasty, wicked, evil, demonic person, but I think worrying about others think about you is...well...over rated. Yes, words can convince more than SOME people to do something, else why would that have been the chief tool of any great Statesman, like FDR, Churchill of Lincoln. That with all of the EVIDENCE coming out about the perpetrator that anyone, and I do mean anyone, would continue to assert that there is some sort of causal connection between the tragic events of Saturday and overheated political commentary on the right is at best sloppy, or at worst a lying political opportunist. So what is my take on this tragic event? That as hard as so many try to make this world a better place both for themselves and for many others, there are a few that determined to hurt others, whether deliberately, or due to some sort of mental illness. Life contains risk and a near certainty that if you live long enough you will experience tragedy in one way or another. I still think we should be discussing how the crazy man got his gun rather than how he got his thoughts. the question is why is this crazy guy on the street? The guns ammunition of the shooters in Arizona and Virginia Tech were obtained legally and easily, by walking into the store off the street. The discussions about public discourse are about how we make it easy for crazy people to get their thoughts. My question is, should we make it so remarkably easy for them to get their semi-automatics?